Hiya! I hope you are all doing well and having a good time at and off your crafting desks! It is time to present the projects by team B today and I hope you will find them as inspirational and beautiful as I do! If you haven't entered our actual challenge yet, I highly recommend you do so as we have two fantastic prizes to give away to two randomly drawn winners among all the proper entries! 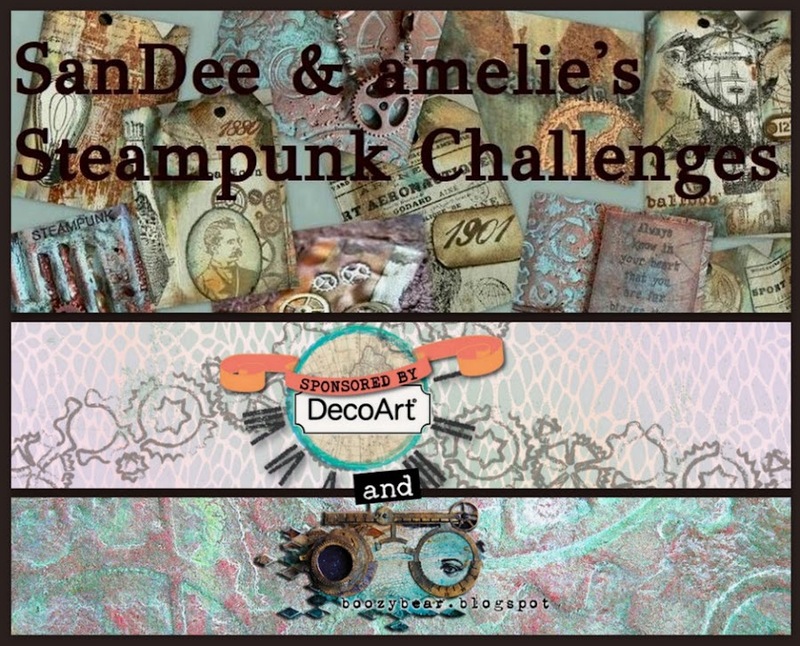 One is an awesome pack of beautiful steampunk chipbpoard pieces sponsored by lovely Glenda from boozybear AND the other a great bundle of DecoArt Media goodness as shown with the image below. 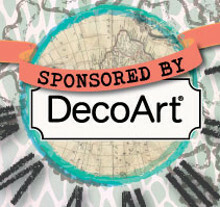 To visit our generous sponsors' online shops, please click the according images on our sidebar! 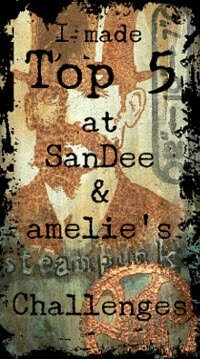 from now on - so there is enough room for your imagination and for enjoying some steampunk fun. Altered Industrial Bottle. I have been determined to improve on altering bottles and am happy I now know the "secret" to getting paint to stick. Through trial and error comes success. 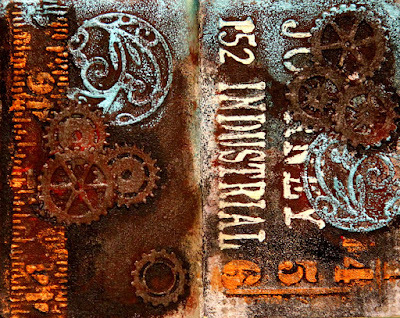 DecoArt media paints, rusting powder and stamps made this bottle come to life. Carpe Diem! media products and various stamps. 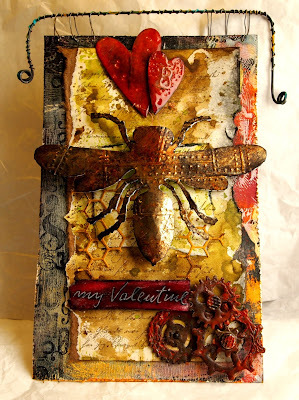 I had a joyful play on a journaling card using some die cuts, ephemera, stencils and rubber stamping! Adding washes, sprinkling on paint and doodling with my white gel pen was very relaxing to do. Our challenge is open until the last day of the month and closes five minutes to midnight CET. Our top 5 and prize winners will be announced on Sat., 12th March. Hi, servus and welcome to today's announcement of our prize winner and Top5! First let me thank you all for participating - there were so many entries and all of them were (as usual) great pieces of steampunk and industrial art! The team and I had a really hard time choosing our favourites and I feel the urge to tell you that many were really close up - but narrow them down to our Top5 we must and we finally did! Huge congrats to you, ladies! We really loved your projects and hope you will be playing along with us again soon! Please, feel free to grab our Top5 badge for display on your blogs! And now on to our prize winner of DecoArt Media's fantastic little "steampunk texture starter bundle" (as I love to call it)! Congrats on your prize win, Sandra! Please, email me (email address see at side bar) so I can forward your shipping details to DecoArt Media! Have fun creating with their great products! 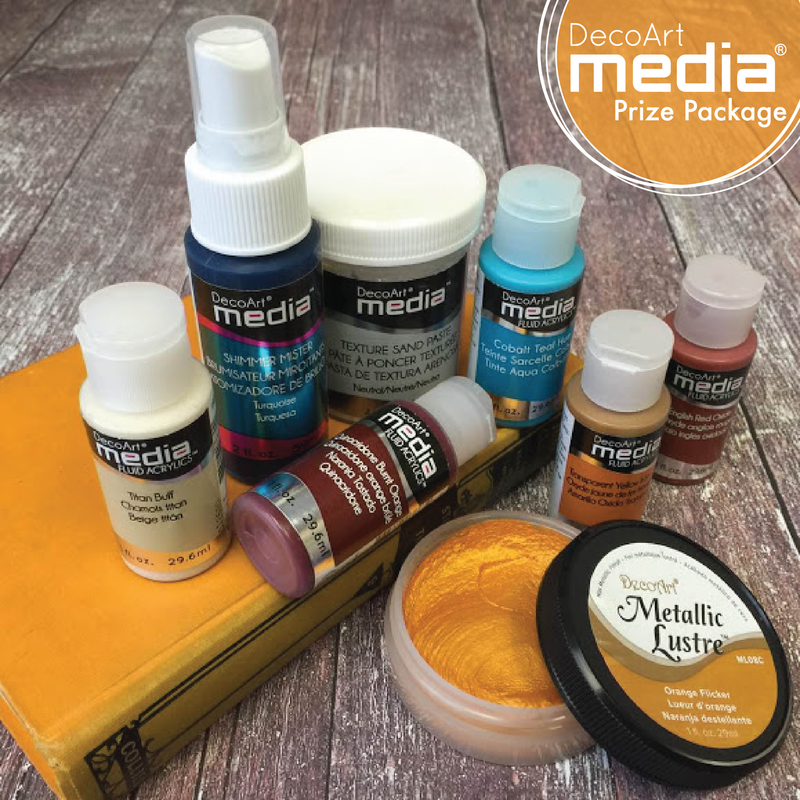 Don't forget: from the February challenge on we are having two prize sponsors - so make sure you don't miss the chance to win either some fab DecoArt goodies (as shown in the picture) or a prize pack with lovely steampunk style chipboard pieces from boozybear! If you want to check out their products just click on the images in our side bar to get to their websites! Our February Challenge - and Some Great News! 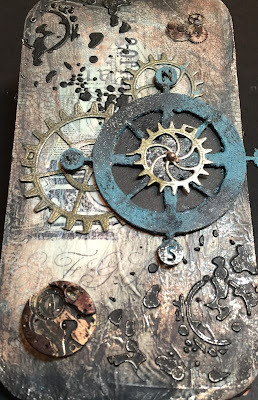 Hi, servus and welcome back to our constantly growing mixed media steampunk corner! 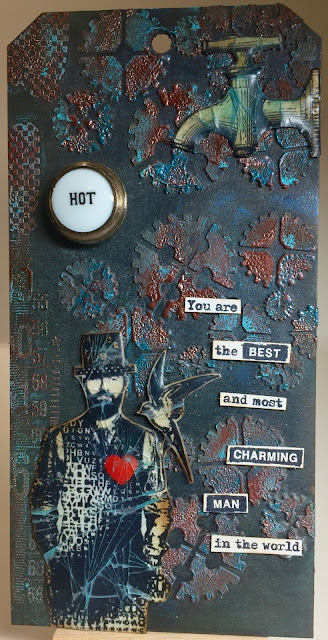 lovely Glenda from boozybear who produces and sells the most beautiful steampunk chipboard pieces on her Etsy store that I have ever seen! 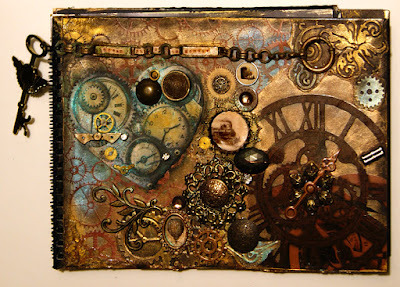 Welcome to our creative steampunk family, Glenda! We are so happy to have you with us!!! 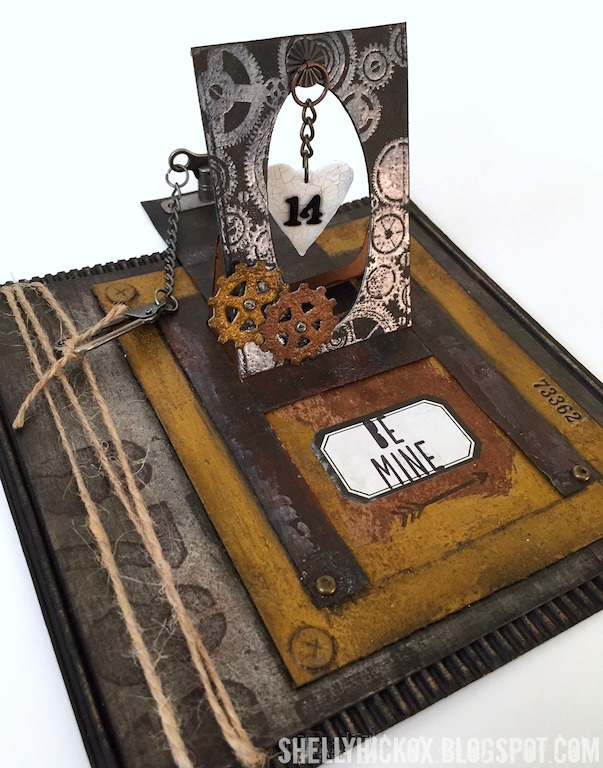 Starting with the February challenge each month Glenda will be giving away one fantastic prize pack of assorted chipboard pieces to one winner who will be randomly drawn from all proper entries! So make sure you don't miss the chance to win!!!! 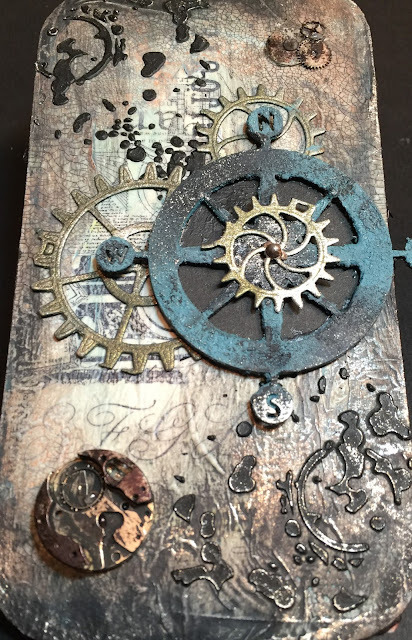 Of course if you want to be sure to get some of her steampunk chipboard goodness just hop over to Glenda's Etsy store and shop away. She ships worldwide and shipping costs are really affordable - and I am sure you will love her designs as much as I do!!! to give away each month - gosh! I am the happiest and proudest challenge blog owner in whole crafty blogland right now. Yay! Thank you so much, boozybear and DecoArt Media! To win one or the other all you have to do is play along and enter (up to three) projects to our monthly challenge. To make sure it is a proper entry, please check out our few rules if you haven't done so already or are new to our challenges. 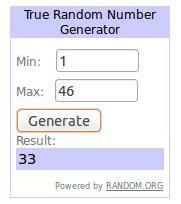 It would be a shame if we had to exclude you from the prize draws or top votes! 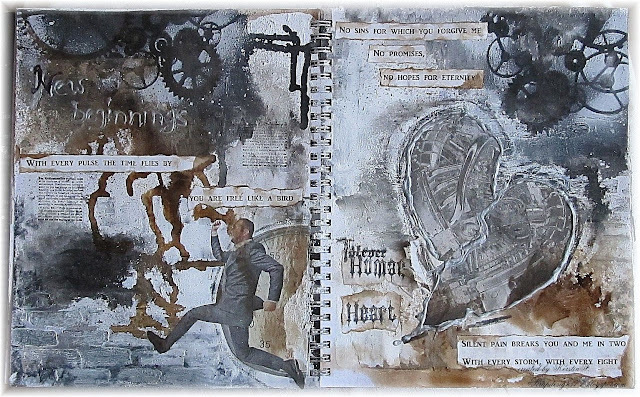 The rules can be found with the pages section below our challenge blog header. 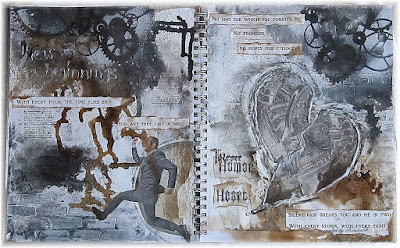 Our challenges will all be "anything goes - steampunk/industrial" ones from now on - so this enables you to let yourselves be struck by inspiration, follow your (steampunk) hearts and enjoy some happy steampunk craftin' time! Team A have created some wonderful projects for your inspiration! To learn more about any how-tos and products used, please, visit their blogs (just click their names to get there) - and let them know you have been there by leaving a short comment! We all know how much we love a little recognition - no matter how short the comment - so please, take a few secs to make them happy! 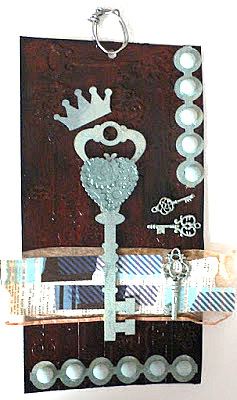 A tag "The key of my heart"
I recycled old wall calendar to make album for my favourite, very old ( about 1890) victorian photos. I wanted it gold :) and it is almost. The prize winner and Top5 from the January challenge will be announced on Saturday, 13th February! Another bundle of inspirational projects awaits you on the 15th of each month - so make sure you don't miss it! Our challenges are open until the last day of the month, 23:55 pm CET. To enter your make, use the inlinkz collection at the bottom of this post.